The Old Kenmare Road is superb trail that meanders through the uplands of Killarney National Park. Forming part of the Kerry Way long distance trail, it is a magical experience that will take you back in time and back to nature. The variety of landscape, flora and fauna along the Old Kenmare Road sets it apart as a truly special trail within Killarney National Park. There is wonderful isolation and stark beauty sandwiched between the bustling towns of Killarney and Kenmare. If you truly want to ‘get away from it all’ and possess a modest level of fitness, then make it your business to spend some time on the Old Kenmare Road. A one way trail of approximately 16km (10 miles), it will reward your efforts at numerous places along the way. Within a few kilometres of departing the car park, you will feel like you have travelled back in time. Even during the busiest summer months, it is a place of peace and solitude. A journey on the Old Kenmare Road through the Killarney National Park is a truly special one. The route forms part of the ‘Kerry Way’, a spectacular long-distance trail that winds its way around the Iveragh Peninsula. The section of the Kerry Way from Killarney to Kenmare is one of the best loved parts of the Kerry Way and it’s not difficult to see why. The route described here combines two separate legs of the Kerry Way to make a fabulous one-way trip from the outskirts of Killarney to Kenmare. The route follows the Owengarrif river valley at the start of the trail. This river flows from the Devil’s Punchbowl on Mangerton mountain before forming a spectacular cascade at the foot of Torc Mountain. The official first leg of The Kerry Way trail is from Killarney town to Torc Waterfall. We’re going to skip that and start from the Upper car park at Torc. Please note that this is a different car park from the main car park at the base of Torc Waterfall on the N71 road. To find the upper car park at Torc, take a left turn off the N71 immediately after you pass the main entrance to Muckross House and Traditional Farms. Follow this narrow road for about 1 km until you reach a small car park where your journey begins. Leave the car park behind you and follow the trail as you head towards the shoulder of Torc Mountain. You will shortly see the Owengarriff river on your right hand side. This river will be a companion for much of the earlier part of the route as the trail closely follows the Owengarriff river as it descends from Mangerton before tumbling spectacularly at Torc Waterfall on its way to Muckross Lake. After you cross a wooden bridge over the river, take an immediate left. After this, there are very few decisions to take regarding which direction to take – the trail is pretty clear and easy to follow throughout. This first section contains a few sharp ascents to get the blood flowing. None are too arduous and most are short in duration so don’t be put off by this early challenge! Accessibility Walkers only, rocky and uneven ground in parts. Facilities None. Bring all required supplies. Next stop Kenmare! Before long, the trail exits the woodlands and emerges into the open expanses of the uplands of Killarney National Park. The southern face of Torc rises to your right and the river valley extends below you on the left. Keep an eye out for the mountain goats perched precariously on the rocks on the far side of the river. Watch out too for the Red Deer as they make their way across the slopes of Torc with considerable ease. From here you will begin to appreciate the wild beauty of the National Park as civilisation slowly ebbs away behind you. This was not always a wilderness area as is evident from the outline of abandoned farmlands enclosed in stone walls along the valley. Throughout the route, there is evidence of settlements from the recent past in what must have been a harsh and unforgiving place to try to forge a living. As the path descends you will see some of these old houses quite close to the trail. More recently, this part of the National Park has witnessed some out of control gorse fires. The fires can spread quickly when certain wind conditions prevail. In 2015, the Old Kenmare Road was used by firefighters to access some of the more remote areas of the Park under threat. As the ground underfoot becomes more sodden, the trail continues on an extensive section of boardwalk for a few kilometres. The addition of a boardwalk has opened up the route to many more people than would have braved the soggy, boggy conditions in the pre-boardwalk days. Thankfully, the ability to wade through knee-deep marshland has been replaced by a much kinder prerequisite of having some sturdy footwear and watching your steps along these boardwalk paths. As the land levels out, you will soon reach a lovely flat, green area known as Cores Cascade. The cascade looks fabulous after some heavy rains but even when it is at a trickle, it makes a great spot for a picnic or a break if you are walking. Watch out for the midges during the summer months! We leave this area and return briefly to some woodland to begin to slowly ascend again. Within the shelter of the trees, the trail follows a stream to a point where some 19th century graffiti is still visible etched on to a rock by the path. The graffiti is believed to have been left by passing soldiers – read more about it on Time Travel Ireland. Passing the rocks, we soon emerge out to the open expanse once more. After negotiating a few rocky outcrops, the familiar boardwalk returns to help you cross some marshy ground again. As you reach the end of the boardwalk, you will begin the descent into a fabulous old oak wood with a carpet of mossy stones along the edge of the path. The descent continues through the oak woods on stony paths and over wooden bridges. Once you emerge from these oak woods, you will soon join a paved road once again. It is at this point that you continue on towards Kenmare by taking a left turn. Taking the road to your right will lead you to Derrycunnihy Church and the main N71 road between Killarney and Kenmare. There are a couple of houses in this area so you may encounter some of the local residents on this section of the trail. Once you become accustomed to the novelty of a paved road again, you will soon begin to return to the wild beauty as the road reverts to a gravel path. Where the trail meets a stream, there are some large stepping stones and a rope rail to help you get across. Please note that many of the river and stream crossings can become impassable after heavy rains. The landscape becomes more stark as the road rises up out of the valley. In many places, the ascents can be steep and there a few zig-zag turns on the path as it rises slowly. On this section of the trail, you get a deeper sense of the isolation as you progress through the rolling hills. The trail continues to snake through this peaceful and quiet landscape. An abandoned house and outbuildings in a cluster of trees is another reminder of relatively recent residences along the trail. You will probably not notice that you have left Killarney National Park as you travel along. The sight of sheep and farm fencing is the only cue to let you know that the Park is behind you. Finally the trail reaches its highest point and the slow steady descent towards Kenmare Bay begins. From this high vantage point, a large tract of planted forestry is visible far below. Continue down along past this forestry to where a fabulous vista of the expanse of Kenmare Bay can be enjoyed at a trailside bench. Kenmare town is hidden behind the peaks of a hill but on a clear day, the views to the Atlantic and west to the Beara Peninsula are a joy to behold. Continue along the sometimes muddy trail and make use of the boardwalk where provided. A sharp descent along a gravel path will bring you to the point where you meet the public road once more. After your journey through the wilds of Killarney National Park and the planted forests beyond, the sight of cars and paved roads brings you back to ‘civilisation’ once more. If you are feeling the strain of the journey at this stage, this is your first opportunity to avail of transport to Kenmare. For those doing round trips, this is often the location where ‘the second car’ is parked. I’ve seen taxis from Kenmare coming to this point as well but it would be a shame to skip the last part of the trail as it has a beautiful finish as it descends into Kenmare town. Out here it is still pretty rural by any standards, but it feels decidedly metropolitan in comparison to the wilderness feel of the uplands we’ve left behind. The trail now transforms to a rural landscape with active farms and busy hedgerows along the path. Slowly but surely, we creep in towards Kenmare as more and more houses line the path on either side. The final steep descent into the town passes more homes until at last, the arrival at the destination is confirmed as we pass shops and schools along the road. As with all one way trails, the return journey can be a challenge. Assuming that you are not going to retrace your steps, there are a few options to consider when deciding how to get there and back again. Getting a lift to Torc is a good way to start this route. The ‘Kerry Way’ officially starts in Killarney town and passes through Muckross and up to Torc before heading for Kenmare. Save that part of the trail for another day and begin at the upper car park of Torc. A taxi journey from Killarney would not be too expensive. Make a night of it: Go mad and book in for the night in Kenmare. An extreme but enjoyable way to not having to worry about getting home! You do still have to get home the next day so you can get a bus from Kenmare – check the timetable to make sure! If you don’t fancy the bus, you could splash out on a taxi but that could be quite costly unless perhaps you are in a large group. The Two Car option is always good but does involve doing a round trip drive to Kenmare and back before you set off on the old Kenmare road. If you are doing this, it might make be an option to leave the second car at the outskirts of Kenmare to save some time. Of course, you could always go for the Best Friend Ever option. This requires a best friend ever to drive to Kenmare and await you arrival and then whisking you home. Caution: this approach could cost a lot more than the price of petrol in the long run J. However you get there and back again, you are certain to enjoy the journey. It a fantastic way to spend time walking, hiking or running through the wild uplands of Killarney National Park. The trail is a journey through time as you pass through valleys formed during the ice age and deserted of settlements in more recent years. And as the trail ends and you slowly ease back towards civilisation, you will treasure your memories from the Old Kenmare Road even more. Doing the two car or Best Friend trick is very handy for a shorter walk from Derrycunnihy to Torc Waterfall / Muckross. Even smallies can manage this trip and love to take a dip at the cascade in the summer. You can add a climb of Torc mountain if you want to take another 90 minutes with the best value climb in Ireland. Thanks Brian, yeah great options you mentioned there. Torc is a great introductory ‘climb’ as well. Hi Andreas, thanks for visiting the site and leaving a comment. 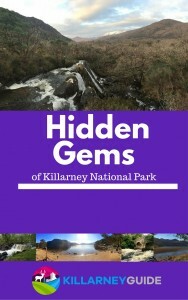 You can get the eBook on Killarney’s Hidden Gems by entering your email at the top of the page. I’ve sent you an email with the link as well. Thanks again! I will comment after next weekend ,when hopefully I will have done the walk at least to the Wendy gap. Thanks for visiting the website and leaving a comment. You can get the eBook by going to killarneyguide.ie/subscribe and entering your email address. You will then be sent a link to where you can download the eBook in the format of your choice. Hi Branko, thanks for leaving the comment. Glad to hear you enjoyed the Old Kenmare Road. It is indeed very impressive! Hi Pete, thanks for leaving the comment. It is a special trail definitely. It is well worth doing if you get a chance to return to Killarney. We’ve decided on a taxy to Derrycunihy Church and then hike down the old Kenmare Road for our first day’s hike. We’ll be coming back this way in a couple of days to walk the Kerry Way anti-clockwise from Kenmare, but wanted to get in a good (< 10 mile) hike early in our trip. … or if they don’t have a “taxy”, maybe we’ll hire a taxi! Thanks for the kind words Mark. That sounds like a good plan. No matter which way you go on this route, you’re in for a treat. There’s no ‘bad’ part to it!! Enjoy the hike and thanks for leaving a comment here. There are a group of us looking to walk the National Park but starting from Kenmare. I have done it before twice this way and have always wanted to do it again. Can you recommend the best start place from Kenmare please? There is a marker on the map in the post called “outskirts of Kenmare”. That is where you meet the quiet road (with cars) when going from Killarney to Kenmare. This would be a good place to start from the Kenmare side if you want to shorten the journey a bit. You could get a taxi to drop you out from Kenmare. I hope this helps. Enjoy the walk, it’s a special trip no matter which way you go or where you start and finish! Thanks Donal – great article. Plan to do this with siblings for my 50th, should be interesting. Thanks for reading, I’m glad you found it useful. Good idea for the 50th! We had a group recently that did the Gap of Dunlop trip for the same occasion!! That’s a fantastic detailed trail from Killarney to kenmare,however I’m starting out in kenmare. Wondering do you have directions that I could follow starting in kenmare. Hi Elena, thanks for visiting the site and the kind words. If you are starting in Kenmare, head out from the Square at the town centre along Railway Road. You will pass Super Valu shop within a few minutes. Continue straight along this road and you will eventually come to the point marked ‘outskirts of Kenmare’ on the map. Alternatively you could get a taxi to this point to shorten the journey. Once you get to this point, you can follow the route in reverse. I hope this helps, enjoy the walk and let me know if there’s anything else I can help with. I am planning on bringing a group of walkers for the Old Kenmare Road, from Torc to Kenmare, 16kms. As we are travelling from Cork and with shorter days, can I have an idea of hjow many hours we need to complete the walk? You should be able to do it in 3.5 hrs so maybe plan for 4 hours to allow for stops etc. Thanks for visiting the site and enjoy the walk! I’m hoping you might be able to help me. A small group of us are hoping to do a sponsored walk in Kilarney in June for Relay For Life. We are part of the Relay for Life Kildare and are hoping to do a relay style walk over two days. Our goal is to walk 120km to represent 120 cancer survivors who took part in last year’s Relay for Life Kildare. Have of our team are hoping to start the walk on Sat morning doing the Kilarney to Kenmare walk(32km) with the other half of our team meeting us in Kenmare to do another 30km. Then on the Sunday we hope to similar however we do not do where to go from Kenmare.